Previously, we explored the domain of the Macrocosm: the universe and the things that are larger than man. This month we will explore the Microcosm: the frontier of “smallness” known as Quantum Physics. How do you look at something smaller than a wavelength of light? Here we will be dealing with subatomic particles, too small to be observed under the most powerful microscopes. All known particles of matter and energy are classified as hadrons, leptons, and force carriers. Scientists believe leptons and force carriers are fundamental particles, meaning they can-not be divided into smaller particles. The most common hadrons are protons and neutrons, the building blocks of the nucleus in an atom. Hadrons have an underlying structure of smaller particles, called quarks. Each quark has a corresponding antiquark. This is one of the most important principles in physics, mainly because the three types of particles from which the ordinary atom is made—electrons, protons, and neutrons—are all subject to it; consequently, all material particles exhibit space-occupying behavior. The Pauli Exclusion Principle underpins many of the characteristic properties of matter, from the large-scale stability of matter to the existence of the periodic table of the elements. Elementary bosons are also called mediators, which carry the four fundamental forces in nature between particles. Particles interact with each other by exchanging mediating bosons. The four fundamental forces are the electromagnetic force, the strong force, the weak force, and the gravitational force. •	Electromagnetic Force: The electromagnetic force governs electricity and magnetism; it affects all hadrons that have electric charge. •	Strong Force: All hadrons are affected by the strong force because they contain quarks. The strong force binds quarks together within hadrons and binds hadrons to one another inside atomic nuclei. •	Weak Force: Hadrons are affected by the weak force, which governs some types of radioactivity, because it affects everything except photons and gluons. •	Gravity: All known particles, hadrons included, are affected by gravity. The electromagnetic force controls interactions between particles with electric charge. The boson that carries the electro-magnetic force is called the photon. The strong force holds together the particles called quarks. All hadrons are affected by the strong force because they contain quarks. Quarks form the particles which make up the nuclei of atoms (protons and neutrons) as well as other particles. The strong force holds quarks together within protons, neutrons and other particles. The bosons that carry the strong force are called gluons. The strong force also prevents the protons in the nucleus from flying apart under the influence of the repulsive electrical force between them (because they all have positive charge). Unlike the more familiar effects of gravity and electromagnet-ism, where the forces become weaker with distance, the strong force becomes stronger with distance! For by him were all things created, that are in heaven, and that are in earth, visible and invisible, whether they be thrones, or dominions, or principalities, or powers: all things were created by him, and for him: And he is before all things, and by him all things [are] held together. The weak force controls how particles change into other particles, or decay. 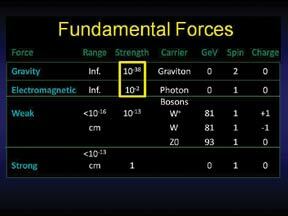 Three bosons, the W+, W-, and Z bosons, carry the weak force. The gravitational force is the attraction between any objects with mass. On the scale of elementary particles and atoms, the gravitational force is the weakest of the four forces. The gravitational force’s boson is the graviton, which has yet to be detected. •	The gravitational force by the graviton? It is non-causal and non-deterministic: everything is probabilistic in some very strange ways. Nothing is real; we cannot say anything about what things are doing when we are not looking at them. Reality is non-local—every particle in the uni-verse is somehow connected. 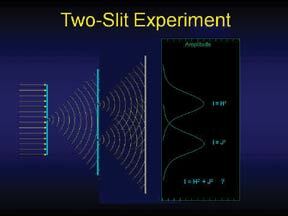 In 1964, John Stewart Bell, from CERN in Geneva, formulated a mathematical approach to demonstrating non-locality: “The Bell Inequality.” In 1982, Alain Aspect, Jean Dalibard, and Gérard Roger, at the Institute of Theoretical and Applied Optics in Paris, conducted a landmark experiment: the Two-Particle Experiment. Two twin photons were expelled by heating cesium atoms with lasers, each traveled in opposite directions through 6.5 meters of pipe to special polarization analyzers. Filters switched in 10 nanoseconds, 30 nanoseconds less than the 13 meters of travel between them. The photons did demonstrate non-locality! Sir Isaac Newton (1642-1727) viewed light as a stream of particles: “corpuscular theory.” Christiaan Huygens (1629-1695) developed the wave theory of light: refraction and reflection of light. Which is correct? Leon Foucault (1819-1868) established that the speed of light was less in water than in air—no surprise for the wave theory; it makes no sense in the corpuscular theory of light. James Clark Maxwell (1839-1879) discovered (among many things) that light is an electromagnetic wave. Heinrich Hertz (1857-1894) established electromagnetic transmission/reception. If a source of photons pass through a slit to a target, one would anticipate a normal distribution around a target as shown in the top chart. The result is H2. 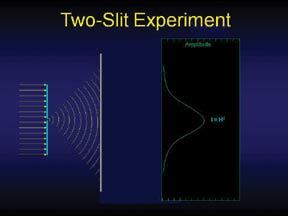 If those photons pass through two slits, one would anticipate two distinct distributions as suggested in the middle chart. You would expect the sum of the two to be H2 + J2. However, what one discovers is a composite distribution as indicated in the bottom chart, where I = (H + J)2 = H2 + J2 + 2HJ, which is clearly a wave phenomena. Viewing each stream of photons as particles, how does each photon passing through the slit “know” about the one going through the other slit? How do they communicate, or thus modify their actions? In 1906, J. J. Thomson received the Nobel Prize for proving electrons were particles. In 1937 his son was awarded the Nobel Prize for proving electrons were waves. The wave/particle duality is the central paradox in quantum physics. There is now compelling evidence that quanta only manifest as particles when we are looking at them! A particle accelerator is used by physicists to study the smallest known particles: the fundamental building blocks of all material things. It’s a machine in which beams of charged particles are accelerated to high energies. Electric fields are used to accelerate the particles while magnets steer and focus them. Beams can be made to collide with a static target or with each other. A collider is a circular accelerator where beams travelling in opposite directions are accelerated and made to interact at designated collision points. Colliding protons will recreate energies and conditions believed last seen a trillionth of a second after the initial moment of Creation. The Large Hadron Collider at CERN, the European Center for Nuclear Research, is an $8 billion facility that took 14 years to build. It spans the border between Switzerland and France near Geneva, is buried up to 300 feet under-ground, and will be used by 10,000 scientists from 100 countries. The LHC is the largest machine in the world with a circumference of 17 miles. It is the fastest race track in the world—trillions of protons traveling at 99.99% speed of light are guided by 9300 magnets, producing 600 million collisions each second traveling at an energy of 7 TeV (teraelectronvolts) in an ultra-vacuum: 10-13 atm (10X < moon) and at temps 100,000 times the core of the sun. There are many controversial aspects to this ambitious project, and there also have been some surprises in another major project in Europe known as GEO600, which is searching for the elusive “graviton.” However, some even more dramatic discoveries appear to have emerged indicating that the entire universe may actually be a super-hologram.